Spit Junction, 1921, looking west along Military Road towards Cremorne with Spit Road to the right and Vista Street on the left. Prior to European settlement, over 3,000 years ago, Mosman was home to the Borogegal and Gamaraigal clans, evidence of which can be seen in the rock shelters, paintings, carvings and middens in the area. European settlement began with a few small farms and the first recorded European settler was Thomas O’Neil at Hunters Bay in 1814. In 1831 Archibald Mosman received a land grant at Great Sirius Cove (today Mosman Bay) where he established a whaling station. In 1859 Richard Hayes Harnett Snr purchased Archibald Mosman’s holdings and set about subdividing the area. Harnett was responsible for promoting the beauty of the area, encouraging day trippers to visit the waterfall and beaches and subsidizing public transport. The increase in the number of visitors led to the establishment of pleasure gardens and various camps, including the artists camps of the 1890s. In 1893 the area became the Municipality of the Borough of Mosman with its own council. At the same time the tram services were extended from North Sydney providing faster access to this new suburb. This new development encouraged real estate agents from other parts of Sydney to set up business in Mosman in order to sell the large tracts of land that were being subdivided. There was an influx of people wanting to live on this side of the harbour and naturally this was followed by the establishment of schools, churches, shops and services. 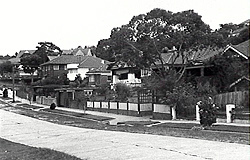 Mosman became known as the Federation suburb, as its first major population explosion and building boom was around 1901, at the time of Australia’s Federation. Mosman was to experience other such bursts of development during the 20th century as land continued to be subdivided, particularly during the 1920s and 1930s, resulting in a wonderful and unique range of inter-war architecture executed by some of Sydney’s most skilled architects. Initially the development of roads in Mosman was fairly haphazard and a consequence of the immediate requirements of the early settlers rather than town planning. As early as 1832 the Surveyor General reserved roads from Milsons Point to parts of the area including Shell Cove, Hunters Beach, Middle and Bradleys Head, Chowder Bay and Great Sirius Cove. In 1862 the first road was cleared by the State Government from Milsons Point to Manly via The Spit. In 1870 another major road, Raglan Road, was laid from Mosman Junction to Mosman Bay and in 1871 a military road was laid from Milsons Point to the fortifications at Middle, Georges and Bradleys Head becoming known as Military Road. Roads providing access to properties were no more than cleared tracks leading from the reserved roads and the harbour. In 1870 Richard Hayes Harnett Snr employed a surveyor to plan the layout of roads. Roads followed the cardinal points due north and south and due east and west. There was no attempt to apply any principles of town planning and Mosman’s terrain added further complications which resulted in winding, steep and divided roads and dead ends. Early roads were unsealed. The land was cleared but no consideration was given to drainage, grading and surfacing. In 1893 Raglan Road, 23 years after being created, was surfaced as a result of public pressure on the council. However, the surfacing and guttering of roads in Mosman continued to be a problem, as finding the right material with which to surface the roads proved difficult. In 1919 Jack H Tonkin joined Mosman Council as an Engineer. His research suggested that concrete was the solution to the persistent problem of road surfacing and he convinced the council to try out this method. He was innovative in the use of bitumen to coat the surface of the concrete in order to handle the abrasions from vehicle tyres. The first roads in Mosman to be concreted were Dalton Road and Medusa Street. Thus began an extensive program of road building by Mosman Council during the 1920s and 1930s. Mosman Council was the first council to use its own staff to build roads and in the 1930s State Government funds were distributed to provide employment for the unemployed. Mosman decided to use this money to employ men to widen, extend and resurface the roads in Mosman. These funds were also diverted to projects such as building the Rotunda and The Promenade at Balmoral.